A gorgeous 15hh chestnut gelding suffering what appeared to be extreme mud fever but has since been diagnosed as Verrucous pastern dermatitis, a skin disease supposedly eradicated from the British Army during the Crimean War. The disease comes as a result of horses being kept in damp and muddy conditions. Major was indeed kept on severely wet bogland all year round. All four feet were abcessed but particularly the two rear ones. He was confiscated by the Gardai on 13th November 2007 on veterinary advice and brought to Sai Sanctuary. He was later passed to IHWT for specialist treatment for which we do not presently have the facilities. The prognosis was poor. 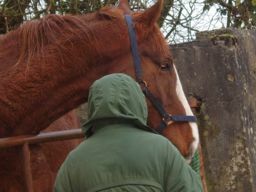 The infection had turned cancerous and the horse was euthanased on 3rd January 2008. Prosecution pending. A very aged donkey mare brought to us on the pretext of needing retirement care. We were told she had some difficulty getting to her feet on slippery surfaces but once up could walk and graze perfectly. She was delivered in a filthy cattle trailer on a late January Sunday evening, lying down, unable to get up and unable to stand unaided. She was in renal failure and had pneumonia. Outraged at the ignorance and meaness of her owner, we made her as comfortable as possible for the night hoping against hope she was just exhausted from her journey. On veterinary advice she was euthanased the next morning. We hope her ex-owner enjoys the money he saved! Due to the distressing circumstances there are no images of Rosie. 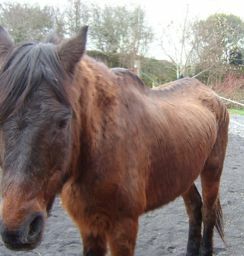 Derry was a very aged and sick 14.3hh dark bay gelding brought in from a dealer at Drumshanbo Mart on 27th October 2007. He was placed with a Sai Sanctuary member who has given him a permanent foster home. He almost certainly had advanced Cushing disease and Infuenza. His teeth were painful so he had difficuty eating. His hooves were in poor condition and he had a possible tumour on his off side. Euthanasia was recommended but we decided to check out his teeth first which proved to be a disastrous mess. Once treated, Derry lost his heavy, curly coat, started eating well and has made a miraculous recovery.